Director/Screenplay – John Sebastian [Curtis Harrington], Producer – George Edwards, Photography – Vilis Lapenjeks, Music – Ronald Stein, Makeup – William Condos, Art Direction – Albert Locayelli. Production Company – AIP. The year 2020. Two Earth rocketships The Vega and the Capella make a landing on Venus, while a third ship remains in orbit. The two crews are separated and struggle to find one another across a hostile terrain filled with carnivorous plants, dinosaurs and turbulent weather. In the 1960s, Roger Corman, one of the canniest and shrewdest of all B movie producers, managed to obtain the rights to two Soviet science-fiction films – Niebo Zowiet/The Heavens Call (1959) and Planeta Burg/Storm Planet (1962) – whereupon he recut the best parts – usually the excellent special effects – and served these up as several entirely new films. The Heavens Call became Battle Beyond the Sun (1963), while Storm Planet was reissued in no less than three different films – this, Queen of Blood (1966) and Voyage to the Planet of Prehistoric Women (1968). Roger Corman always gave these projects to young novice directors – on the credits of these films one can find such later-to-be luminaries as Curtis Harrington (hiding here behind the pseudonym John Sebastian), Francis Ford Coppola, Stephanie Rothman and Peter Bogdanovich. (Stephanie Rothman is also listed here as associate producer, while later-to-be Star Wars (1977) producer Gary Kurtz can be found credited as production manager). While the later efforts taken from these Russian science-fiction films add more new film to the transplanted special effects, both here and in Battle Beyond the Sun fairly much the whole of the film is taken from the original Russian footage. Here there have been a few original scenes filmed with 1950s B movie heroine Faith Domergue and fomer Sherlock Holmes series star Basil Rathbone (age 73 and towards the end of his career at this point) – but these are minor inserts and 95+% of Voyage to the Prehistoric Planet is taken from the Russian original. Aside from Faith Domergue and Basil Rathbone, for instance, all the rest of the cast are the original Russian actors. Both here and in Battle Beyond the Stars, Roger Corman simply made up a host of English-sounding names on the cast list to convince audiences that they were seeing an original American-made production. One would have loved to have seen the original Storm Planet for purposes of comparison – what is seen of it here looks fabulous and far grander than almost any English-language science-fiction films that were being made around the time. (The same was the case with Battle Beyond the Sun). Venus is portrayed with a wonderfully pulpish vigour – giant Venus flytrap plants, brontosauruses, mini-Godzilla creatures, pterodactyls and journeys across hostile rocky landscapes. There is a dreamily lyrical scene with the astronauts venturing underwater and finding the ruins of a city and a peculiar sequence where one astronaut is lured away by a woman in a pink negligee who swims away leading him on a chase through the seaweed. There is also the appealingly quaint gadgetry that was considered futuristic in the era – flying cars and a wonderfully cool robot design. 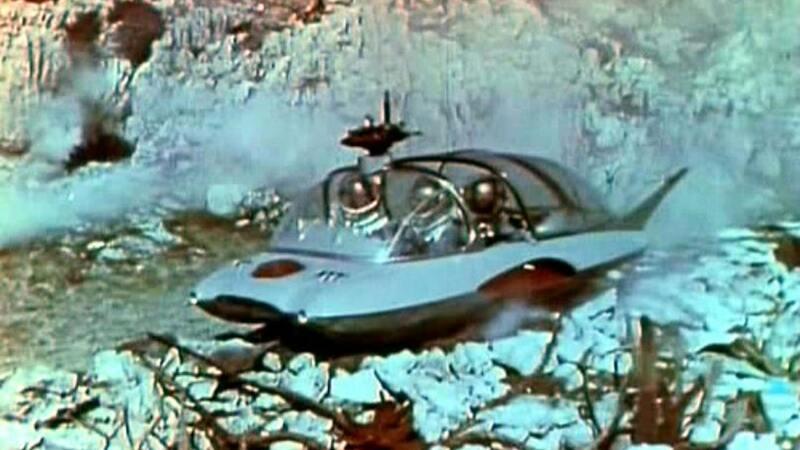 One of the funniest moments in the film is a scene where the robot has to carry two astronauts across a river of lava only for it to decide halfway across that it is carrying too much weight and must dump one of them, with they then left hanging off it and trying to reprogram it while it stands in the middle of the lava. 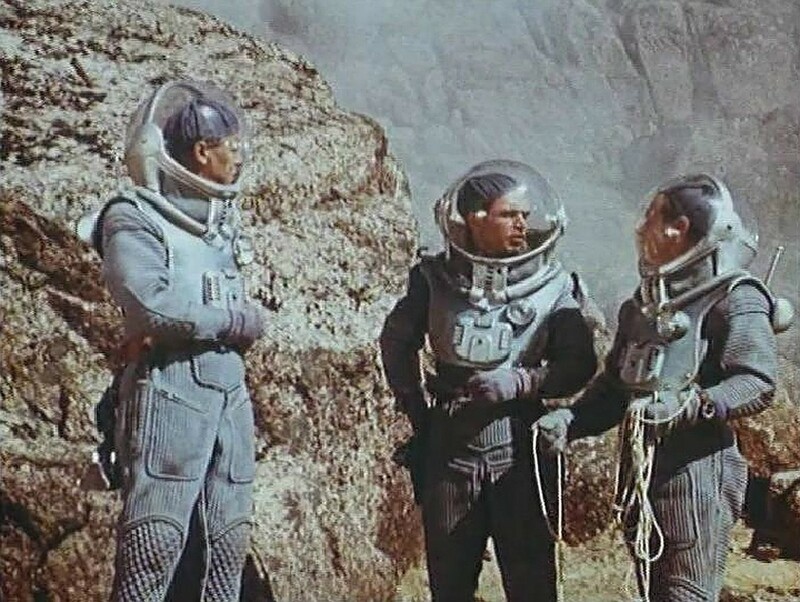 The human element is stolid, as always tended to be the case in Eastern bloc science-fiction films of the era, with the astronauts rarely able to be distinguished apart. There is a certain effective twist ending where the astronauts find the image of a face inside a rock and depart believing it to be an artefact from a long-lost civilisation, while in the very last shot we see the reflection of a face inside a pool of water looking up at their departing rocket. Curtis Harrington’s other genre films are:– the low-budget mermaid film Night Tide (1961); the aforementioned alien vampire film Queen of Blood (1966), also was for Roger Corman and from reused Russian science-fiction footage; the psycho-thriller Games (1967); the Batty Old Dames psycho-thriller How Awful About Allan (tv movie, 1970); the Batty Old Dames psycho-thriller What’s the Matter with Helen? (1971); the Batty Old Dames psycho-thriller Whoever Slew Auntie Roo? (1971); The Cat Creature (tv movie, 1973); the Batty Old Dames psycho-thriller The Killing Kind (1973); the voodoo/zombie film The Dead Don’t Die (tv movie, 1975); Killer Bees (tv movie, 1974); Ruby (1977) set in a haunted drive-in theatre; and Devil Dog: Hound of Hell (tv movie, 1978) about a Satanic dog.